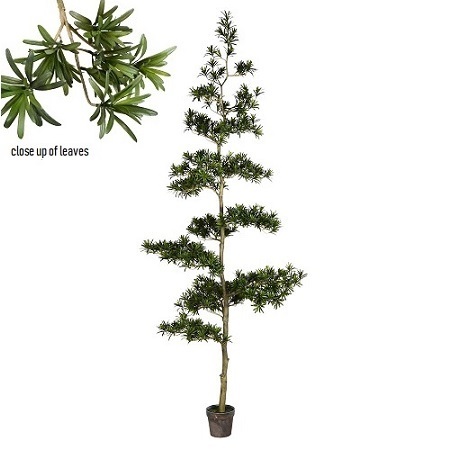 Artificial Potted Podocarpus Tree with 9870 Leaves. Although not a native tree, it would work as a spectacular addition to a North woods theme party when added with other species. Could also use in New Years or Winter parties. PROM THEME IDEAS: The natural distribution of this species consists of much of Africa, Asia, Australia, Central and South America and several South Pacific islands, If your theme points to any of these countries, it may be a great idea to add to the gymnasium to fill in those wide open spaces as it towers 9 feet.